I had good intentions this morning. Although it had snowed some over the night that really wasn’t the problem. It was the wind! It was blowing 15 to 20 mph out of the NW to W with even higher gust. I drove to the put in on the Rum River in Anoka. There wasn’t anyone else in the parking lot getting ready to paddle. I wonder why? The first problem I encountered was the wind but I had a second problem which was the temperature; but not because I was cold. 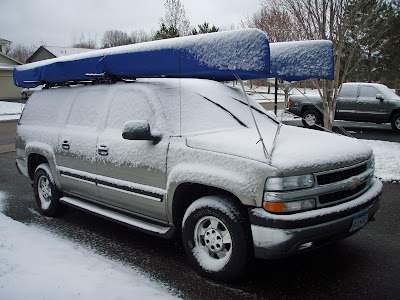 The temperature was 30 degrees and my ropes securing my canoes to my Suburban were frozen. I worked on the first knot for about 10 minutes trying to loosen it before I gave up and walked down to the river to check it out. I wasn’t going to cut the rope because I had other knots to loosen if I was going to paddle today. I was thinking of paddling about three and a half hours today, but with the wind I thought maybe 2 hours. Since I couldn’t get the rope undone it was probably best that I just go to the health club and do some cardio. It sure would be a very cold swim if I went over today. I drove back home and changed into some workout clothes to go to the gym. I did an hour on the LifeFitness cross trainer. Next I was off to Midwest mountaineering’s Outdoor Expo. 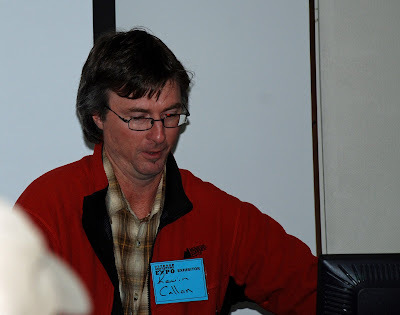 I arrived about 11:30 hours and went downstairs to the Expedition Stage to see Kevin Callan’s presentation, Northern Ontario’s Kopka River Misadventure. The room was filled with people watching a presentation on the Apostle Islands. I saw Kevin waiting in the back of the room like I was so I said hi to him. Last year when I spoke to Kevin he wanted me to e-mail him about my thoughts about the section of the trip I would be taking between the Maligne River and Minn Lake. I e-mailed him my trip report, Quetico’s Trees, Rocks and Water: A Solo Journey. I walked around and spoke to a few vendors before I went to see another one of Kevin Callan’s presentation, Ontario’s Best Canoe Routes, across the street in another building. It was approaching 2 pm and the earlier presentation wasn’t over so I walked in the room while everyone else waited in the lobby. 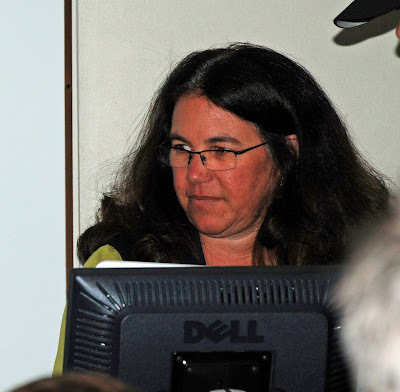 I walked in and saw it Kim Young, Quetico Kim, as she is known on some forums finishing up her talk, Making the Quetico Quest. I have corresponded with her through e-mail in the past so after she was done I went and introduced myself. Although I didn’t listen to her presentation I know she had an article in the Winter 2007 The Boundary Waters Journal by the same name. I left for home after I listened to Kevin. Once home I started getting my cycling gear ready for tomorrows Ironman ride. I would like to do the 100 mile ride, but I’ll see what the weather is like tomorrow before I make my decision.